Cortec has successfully replaced hazardous synthetic chemicals with safe ‘green’ alternatives, thanks to technological innovations. Committed research, study, and experimentation has enabled Cortec to produce ecologically safe corrosion control solutions whose performance has outgrown conventional rust preventatives. Not only are these bio-based environmentally safe alternatives functionally superior to conventional petroleum derived products but they make a far more economical solution. Cortec recently launched the production of its biobased and biodegradable coatings for corrosion protection in metalworking industries in Croatia. Cortec’s new system containing biobased yet efficient products are a safe alternative to hazardous petroleum derived products sold in EU by Fuchs, Castrol, BRANOpac, EXCOR, Bantleon, and others. This latest launch in Central Europe will make the whole system more accessible and cost efficient for European customers. 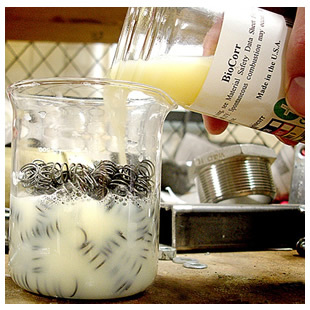 BioCorr is water based, and a ready to use formulation intended for preservation of metals in storage and during transportation. Formulated with renewable raw materials BioCorr contains 64% biobased content. It provides multi-metal corrosion protection by combining film-forming additives with Vapor phase Corrosion Inhibitors (VpCIs). 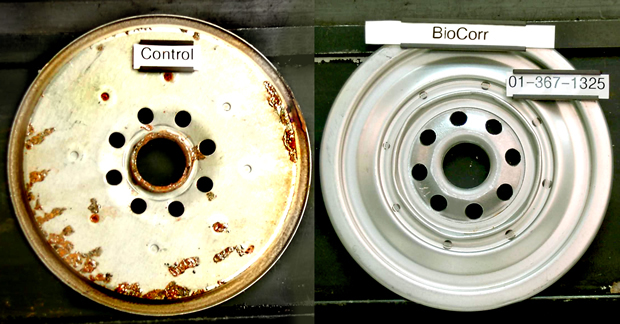 This biobased product not only performs well when compared to conventional rust preventatives, but also enables costsavings. BioCorr provides protection for up to two years of indoor storage or during shipments. Unlike rust preventative oils it leaves a dry film on the surface of the metal that is virtually undetectable. This feature helps to create a clean workplace and prevent material waste. It is used for protection of machines and equipment, pipes, flanges, gears, cast iron, sheets, and coils; and as temporary coating for storage and shipment. It will be available in quantities according to European Union Measure Standards. The product will be packaged in 5, 10, and 20l pails as well as 200l drums. EcoLine 3220 and EcoLine 3690 are biobased and biodegradable coatings developed to replace traditional oil based rust preventatives eliminating expensive disposal costs associated with oils. They provide corrosion protection while being environmentally safe and completely non-hazardous. Coatings conform to NACE StandardRP0487-2000. EcoLine 3220is a canola-oil based biodegradable, ready-to use temporary coating that offers a tenacious film which clings to metal surfaces, providing excellent contact corrosion protection in storage and shipment. It provides long lasting vapor corrosion inhibition, as well as a balance of corrosion protection and lubrication. EcoLine 3690 - offers an open-air corrosion protection as a safe replacement for more expensive polluting solvent based rust preventatives such as Tectyl and Cosmoline. Made from renewable materials and containing canola oil as a carrier, it has thermostability and no effect on rubber, plastics or paints. This coating is designed for marine and high humidity conditions. EcoLine Cleaner/Degreaseris soya-based product aimed for tough cleaning jobs in industrial and commercial applications. It can be used on all engineered metals and alloys. Unlike harmful or hazardous solvent cleaners, it is safe to handle, non-flammable, and has been certified as a USDA biobased product. Burkert’s AirLINE Ex 8650 System Allows Safe Combination of Pneumatics & Electronics in Zone 1 Blending System for N.Sea.